Note: This post is written in response to recent articles about museums by Arianna Huffington (on museums and new media) and Ed Rothstein (on museums and ethnic identity). 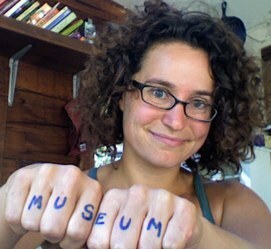 I appreciate that you write about museums, and by doing so, publicize their work and efforts. I appreciate that you write thoughtfully about changes in the cultural sector. But I'm a bit frustrated by the short-sightedness of your vision with regard to the role that museums serve in society. In short, I think you focus too much on your personal experience and preferences, not acknowledging the fact that you represent an incredibly small and rare slice of museums' intended audience. It's not about you. It's about culture, learning, and community space--for everyone. the idea that (art) museums are fundamentally for a contemplative experience, and that techniques that distract from classical forms of contemplation are therefore bad. the idea that it's ok for (American) museums to have a Euro- and white-centric approach to interpretation, but not ok for them to center on minority identities or approaches. Myth #1: Museums are about contemplation. In October, Rothstein bemoaned the way that mobile phones have distracted people from looking at art. Last week, Huffington mused on the same question with regard to social media, worrying that museums might lose their power as secret gardens of idle aesthetic pleasure in a world overrun with media. While both these articles have some reasonable points in them, the underlying argument reflects a bias about what museums are for. Museums are not fundamentally for "contemplation" any more than they are for "celebration" or "exploration" or "challenge." Looking at the data on museum use, very few visitors come alone to sit in quiet reverence and soak in the beauty. As John Falk's research has shown, these "spiritual pilgrims" represent a much smaller percentage of museum audiences than those who come for social experiences, to learn something, or to have novel experiences. When critics coo over museums as aesthetic temples, I get nervous. These same folks prefer their galleries sparsely used and quiet. They are nostalgic for a type of museum experience that is frankly both endangered and dangerous to the long-term future of museums. They remind me of Catholics who miss the old days when everything was in Latin and ignore the fact that the antiquated rituals they long for also led to serious erosion of use and value of the churches themselves. This nostalgia threatens museums' abilities to engage younger, more diverse audiences. I understand why connoisseurs of classical museum experiences can feel threatened--but that doesn't mean they get to arbitrate what makes a quality museum experience in an age when museums have gotten serious about universal access, inclusion, and diverse learning styles. New interpretative techniques don't threaten the fundamental value of museum experiences; most of these tools thoughtfully create new opportunities for access, enjoyment, and understanding. I've heard many people rant about how "no one looks at the artifacts anymore! They just snap photos through their phones!" but you could equivalently argue that these digital memories help people form relationships with artifacts and images beyond a single fleeting visit. I appreciate Huffington's argument that we should avoid "social media being the point of social media," but I also worry when she writes that "the wrong kind of connection can actually disconnect us from the aesthetic experience." I have a very hard time imagining that anyone, even an incredibly knowledgeable media-maker such as Huffington, can fairly arbitrate what is and isn't the "right" kind of connection. If you gasp when you see an artifact, I snap a photo, and another visitor texts her friend about the experience, is one of us doing it wrong? It's time to put to rest the idea that there is a basic adversarial relationship between technology and quality museum experiences. The important thing is not that a museum employs these tools or those. What's important is that museums relentlessly pursue strategies that allow them to be as relevant, useful, and essential to their communities as possible. Myth #2: White-centric is OK, other-centric is not. This myth is primarily put forward in Edward Rothstein's recent rant about identity museums, though its bias is reflected in Myth #1 as well (since the contemplative temple vision of museums is innately wrapped up with a Euro-centric vision of what museums are for). Rothstein criticizes a show on Muslim scientific discoveries and others for being ineffectual, revisionist messes. While there's some validity to his argument that exhibitions that scream, "Me!" are often uninteresting, Rothstein seriously understates the extent to which the majority of European and American museums have an unrelenting, white, wealthy "Me!" encrusted on their walls. Rothstein admits that "even the great imperial museums of Vienna, London, and Paris .. reflect the power and grandeur of their creators." I'd argue that he should replace the word "even" with "especially." Imagine being a young woman walking into a science museum in which Marie Curie is the only female name chiseled into the wall of heroes. Imagine being a member of an indigenous tribe that is treated solely as ancient history in an anthropological museum. Imagine being poor, or an immigrant, or anyone who isn't part of the great colonizing story of most museums and historic houses. It would get pretty damn tiring seeing all those "Me! "s that belong to someone else. I'm not suggesting that we move to a world in which we have a rainbow of identity museums for every background and interest group. Instead, I think it would be incredibly useful if we would acknowledge the inherent biases that come with any design process and figure out how to transcend them. I'm thinking of projects like Dialogue in the Dark, in which blind guides lead visitors through a pitch-black, multi-sensory environment, or places like the Wing Luke Asian Museum, which strikes an incredible balance between telling a uniquely ethnic story and welcoming non-Asians into it. I'm thinking of the tensions and lessons that come when an institution authentically engages with new audiences, as in the St. Louis Science Center's YES program or the Glasgow Open Museum. I'm thinking of places like the American Visionary Art Museum, whose educational mission is to "expand the definition of a worthwhile life." So, my professional, critical, and museum-loving friends, let's get beyond these out-of-date ideas about museums as temples to the past and start figuring out how to make them even better for the future.